The ecoPayz VIP Program consists of 5 different VIP levels and is built to reward their most active and loyal account holders. Compared to other eWallet VIP systems it is not only about the transaction volume to reach higher VIP levels. 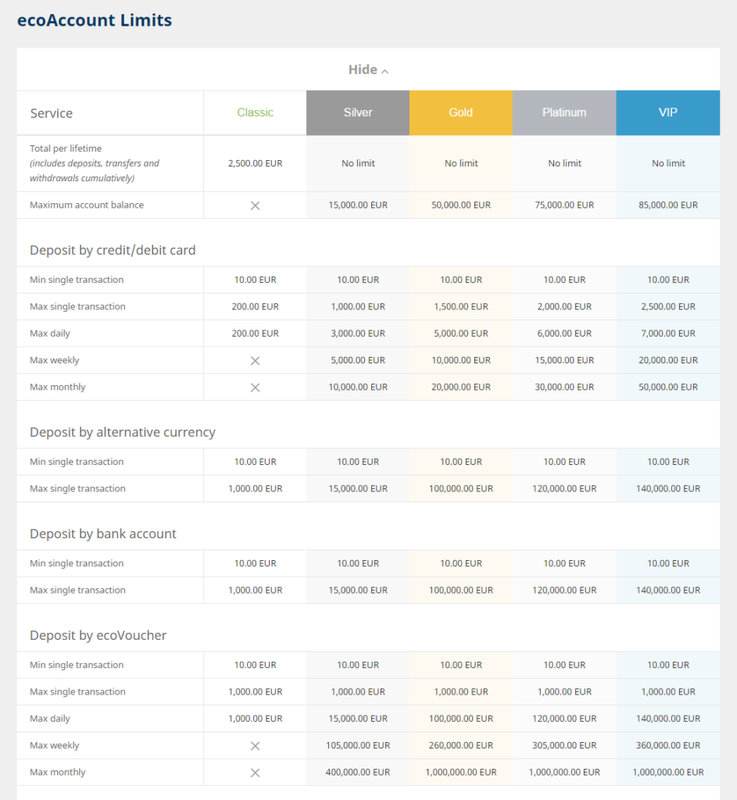 Every VIP level comes with additional benefits, like a reduced currency conversion fee and increased transfer and withdrawal limits. This page will give you a quick overview about all VIP levels, their benefits and also the benefits you will enjoy by signing up with us. 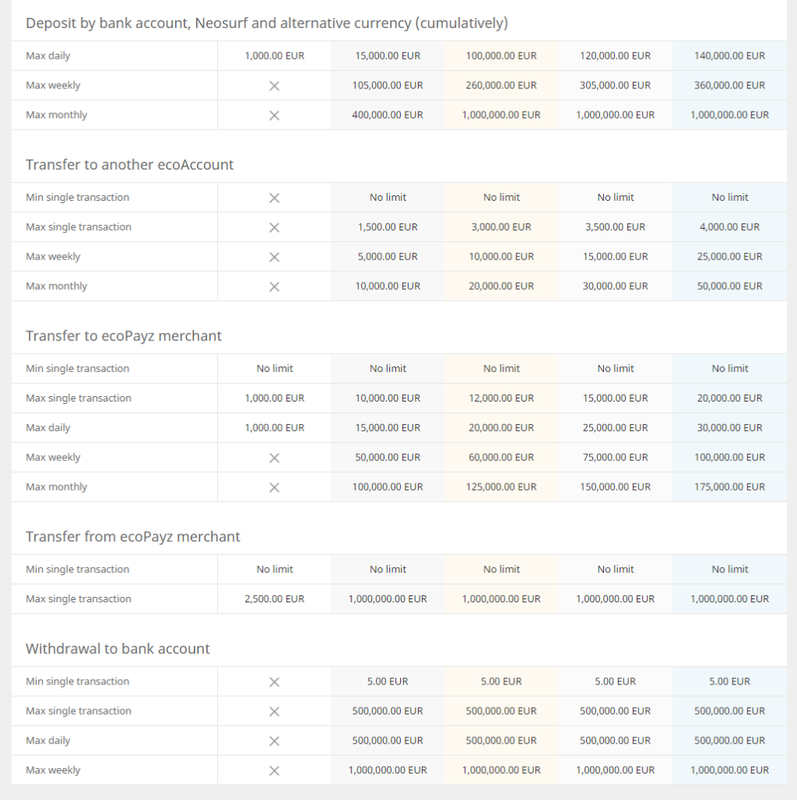 You can see your current ecoPayz VIP level at the top of the left-handed ecoAccount menu. eWallet-Optimizer clients enjoy an instant VIP upgrade to Gold VIP level right after your verification. If you are no gold VIP yet, just submit your account details and let us check if we can get you upgraded. RegistrationThat is the lowest level for all new customers. Verification is not needed. You will become a Bronze VIP right after you have created your account. VerifiedOnce you have successfully verified your account you will automatically be upgraded to Silver VIP. No transfers or other requirements. €5,000Deposit at least 5,000 EUR (or 2,500 EUR by credit card or debit card), be silver for 30 days and verify your address and identity. €50,000Be a gold VIP for at least 30 days, owner of an activated ecoPayz ecoCard MasterCard and you need to transfer at least 50,000 EUR to merchants. €250,000Be a platinum VIP member for at least 30 days and transfer at least 250,000 EUR from your account to any merchant to get upgraded. You will also be able to use up to 5 ecoVirtualcards each day and will be able to order up to 3 physical ecoPayz MasterCards for all your different currency accounts, which are available in EUR, USD and GBP. All eWO clients will be upgrade to Gold VIP level instantly after their verification and can enjoy all benefits of the Gold level. 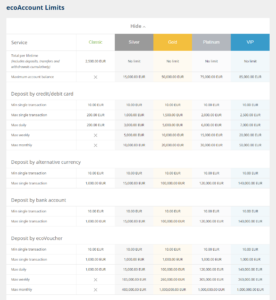 In addition you will also have increased transaction limits and you can use our personalized support. Make sure to submit your account details to not miss any of our benefits. 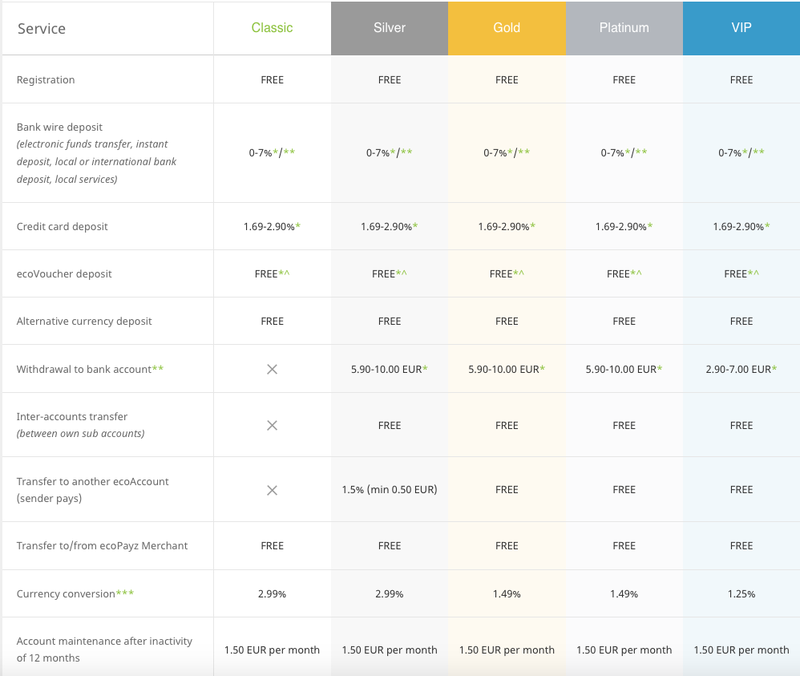 More details about all ecoPayz fees and limits you can find on our ecoPayz Fee & Limits page or contact us if you have any further questions. ecoPayz has an easy and straight forward VIP program which comes with a lot of benefits. Even customers with lower transaction volumes can benefits from it. 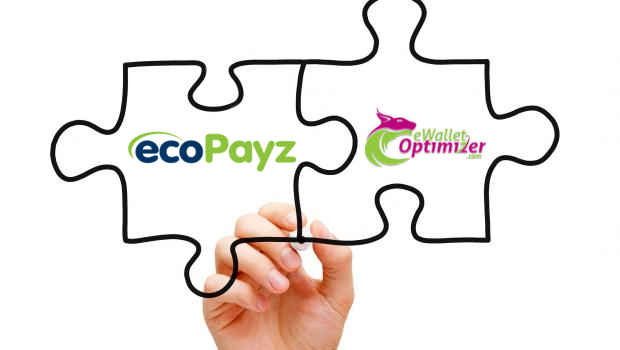 However, in combination with our free eWO ecoPayz Bonus program you will get the most out of your ecoPayz account and enjoy even more benefits. 0.5-0.65% Cashback on your outgoing Transfers. Fast tracked verification – fully verified within a few hours, 7 days a week. 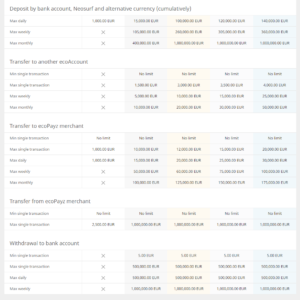 Highest transaction and p2p limits. 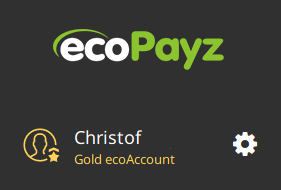 If you are interested in joining ecoPayz and want to become ecoPayz GOLD VIP member right after account verification, please proceed with our registration or contact us for any further questions. That is the lowest level for all new customers. Verification is not needed. You will become a Bronze VIP right after you have created your account. Once you have successfully verified your account you will automatically be upgraded to Silver VIP. No transfers or other requirements. 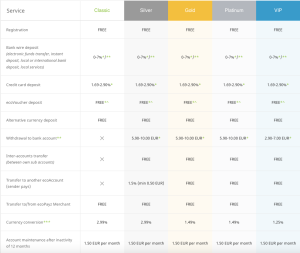 Deposit at least 5,000 EUR (or 2,500 EUR by credit card), be silver for 30 days and verify your address and identity. Instant Gold VIP for eWO clients. Be a gold VIP for at least 30 days, owner of an activated ecoPayz ecoCard MasterCard and you need to transfer at least 50,000 EUR to merchants. Be a platinum VIP for at least 30 days and transferred at least 250,000 EUR to merchants. After 10,000 EUR transfers for eWO clients.